This is not your parents’ Art and Science of Sails, written by Tom Whidden and Michael Levitt and published in 1990 by St. Martin’s Press. The first edition was a Main Selection of the Dolphin Book Club. The Second Revised Edition is published by North Sails Group, LLC and Seapoint Books + Media and written by the same duo. What a difference 26 years makes! Today there are one-piece sails made over a 3D mold in the shape they will assume in the wind. Sail plans have radically evolved to fractional rigs, fat-head mains, and non-overlapping jibs. That is true for racing sails and sailors as well as cruising sails and cruisers. Thus, ninety percent of the text is new, as are almost all of the more than 100 photographs and technical illustrations. The authors focus on circulation as they did in the first edition, but now come at it from a different direction. And for the first time anywhere, they attempt to quantify its effects. Where the wind speeds up and why as it passes over a sail plan, and where it slows down and why. Circulation theory is familiar to aerodynamicists for at least 100 years and is argued about by sailors at least since 1973, when the late Arvel Gentry loosed his theories on the sailing world. Gentry was an aerodynamicist at Boeing by day and a sailor on the weekends. And the theories used to explain why airplanes fly were at odds with the theories of why sailboats sail to weather and what the slot actually does. Whether you believe in the theories or not, they have had a profound effect on sails, sailing, and even yacht design. This is not sails—or sailing—made easy. This is unapologetically a serious book for serious sailors, even though the beginning sailor will learn much. And, it celebrates the centuries-old beauty of the sport of sailing along with the fascination of the technology of sails through stunning photos and illuminating illustrations. Why fractional rigs, fat-head mains, and non-overlapping jibs have come to predominate. Why and how leech twist can be a sail-trimmer’s best friend. Why a yacht designer positions the mast, keel, and rudder to create some weather helm. Why the safe-leeward position is advantageous relative to the entire fleet, not just to the boat you tacked beneath and forward of. Why a mainsail’s efficiency is improved with added upper roach, beyond the value of the extra area. Why the miracle of upwind sailing is not that there is so much lift but so little drag. Why, when sailing upwind, the main is always trimmed to a tighter angle than the jib. What a polar diagram tells us or why tacking downwind is almost always faster than sailing directly to a mark. There is also an in-depth look at the wonders of material utilization—not just materials. And the final three chapters are a users-guide to mainsails, headsails, and spinnakers. Tom Whidden is president and CEO of North Technology Group, which includes North Sails—and since the 1970s has been and continues to be the largest sailmaker in the world. Whidden is an America’s Cup sailor who has won the Cup three times: 1980, 1986-87, and 1988, primarily as tactician for Dennis Conner. Whidden is in the America’s Cup Hall of Fame. He is the author of three books on sails and sailing. Michael Levitt is the author of 14 books, as well as the former communications director of the New York Yacht Club and a former editor at such publications as Nautical Quarterly (which won a National Magazine Award for Design), Sailing World, and Yachting. His book America’s Cup 1851-1992 – the Official Record won a Benjamin Franklin Award as the outstanding book in the Outdoor Recreation category as presented by IBPA in 1993. “A fascinating look at the science and history that has led us to today's highly technical world of sailmaking. The book does a wonderful job of explaining the physics behind both trimming of sails and state-of-the-art sailmaking.” – Bora Gulari, two-time Moth World Champion and U.S. Sailing Rolex Yachtsman of the Year. “Tom Whidden and Michael Levitt’s book is a clear, reliable guide to getting the most out of your sails, an essential component to good seamanship whether you’re cruising or racing.” —John Rousmaniere, author, The Annapolis Book of Seamanship. Praise for the First Edition of The Art and Science of Sails. “The book is gracefully written and deserves to be a classic.” —Sailing World magazine. “I’ve known Tom Whidden for quite a while since he crewed for me on the 12-Metre Nefertiti. He has always been a student of the technical and business aspects of sailmaking. Whidden has a common-sense approach gained from hands-on ocean racing experience.” — Ted Hood, the late sailmaker, yacht designer, boatbuilder, marina developer, winning America’s Cup skipper, Yachtsman of the Year, and industry leader. 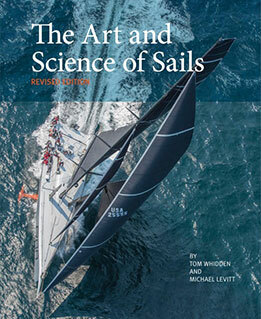 “Whidden and Levitt know as much about sails as anybody alive, and they show it in this book. I wish I’d had it to read during my 150 days around alone in American Promise.” —The late Dodge Morgan, who in 1986 was the first American to sail solo around the world nonstop— in 150 days, cutting the prior record of 292 days nearly in half.